This article is part of a year-long feature - watching and blogging about twenty acclaimed, cult, challenging and rare films over the course of 2013. The full list of films can be found here. 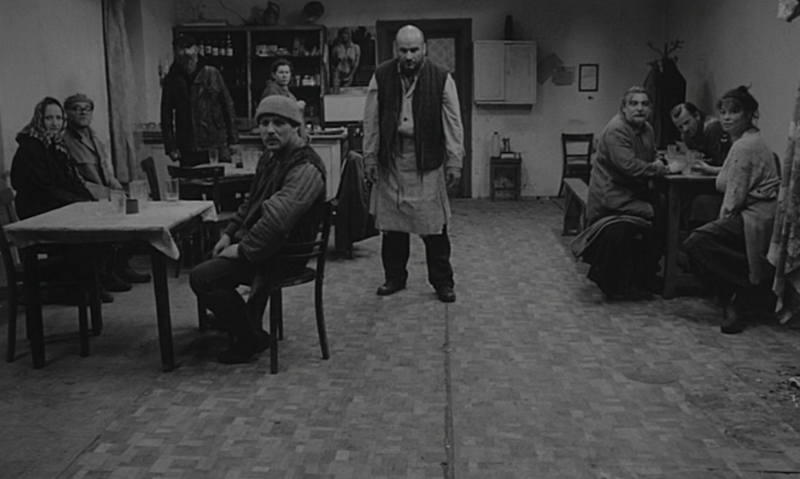 First up: diving straight into the deep end Béla Tarr's seven-hour opus Sátántangó. No benefit beating around the bush - Sátántangó's most immediately noteworthy trait is its sheer length. 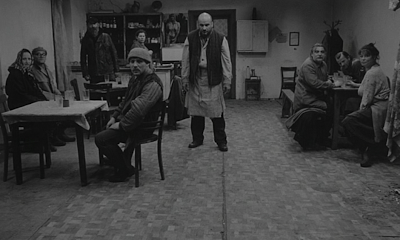 Along with Shoah (also on my 2013 list), it is undoubtedly amongst the most acclaimed of all the 'long films'. Where many of the particularly lengthy features in existence are experimental, novelty or indeed 'made originally for television' titles, Sátántangó is a fully-formed, functional feature that just happens to be 419 minutes long (allowing for PAL DVD speed-up - international viewers have another half hour to contend with). It's also recommended to be tackled in one viewing, albeit with Tarr (apparently reluctantly) making the bladder-friendly concession of two intervals. The mere act of sitting down to watch Sátántangó requires considerable forward planning - the best part of a waking day needs to be cleared, preferably ensuring a bare minimum of distractions during that time so you can embrace its oppressive, unique atmosphere to its fullest. No doubt a cinema viewing would be the ideal way to experience it (especially since the Artificial Eye DVD anyway is showing its age through non-anamorphic widescreen). With logistics out of the way, Sátántangó's second most striking trait is its bold style. Although I lost my Tarr virginity last year with The Turin Horse, the director's singular visual style is still exhiliratingly fresh and engaging upon second contact. Shot in stark black & white and employing a keen eye for symmetrical compositions, Sátántangó's average shot length is measured in minutes, not the seconds we're all used to. It's full of meditative tracking shots, dynamic Steadicam manouveres and elaborate pans. Tarr and his cinematographer Gábor Medvigy illustrate a mastery of cinematic movement, with the motion of the camera being perhaps the single-most significant tool in crafting the film's distinctively hypnotic pace and mood. There are too many stunning images to mention - the famous opening shots of cows roaming through village streets, men traversing galeforce winds as debris whirls around them, the sight of a feeble doctor attempting to reach the light of a distant public house, the camera waltzing around walls and windows in an abandoned mansion. At times, the camera even cheekily implicates us as voyeurs - gazing through binoculars or an open window when we shouldn't be. It's appropriate that the film only ends when a character actively blocks out the light sources in his home, slowly rendering the light-dependent camera useless. Sound too is utilised to electrifying effect. There's the music, which when invoked adds a further layer of surrealism to the already dreamlike (or is that nightmarish?) images. One music cue recurs repeatedly, for varying lengths, and occasionally even actively drowns out conversations so we can focus on expressions and landscapes while the highly peculiar tune cycles. In another scene, one poor on-screen soul blasts out a repetitive accordion ditty for a good ten-minutes straight as his comrades drunkenly and sleazily dance around the local pub. But it's not just music, as the atmosphere is further heightened by the almost unsettling sounds of heavy footsteps, florescent lights, invisible machines and roaring storms. Tarr - ever able to conjure up his morbidly deadpan sense of humour even in the bleakest of scenes - slyly allows an impatiently ticking clock to dominate the soundscape from time to time - one must suspect he's all too aware of the potential feelings of an audience member that has decided to dedicate nearly a third of their day to a single film. Repetition of sound is consistently employed - whether its through dialogue, music or background noises - to craft a sense of unease and dread. In terms of narrative, the film is much more compelling than I expected from its reputation as a grueling but rewarding endurance test. For the first half or so Tarr follows the various inhabitants of a poor Hungarian village over the course of twenty-four hours. They have just received their annual influx of cash, and everyone wants the lump sum for themselves. After a tragedy, a returning local named Irimiás (Mihály Vig) persuades the villagers to abandon their homesteads and invest all the money in a community farm instead. However, we know that he has other plans (explosive ones, seemingly). The final sequences - there's twelve all-in-all - portray the aftermath of the villager's decision. Tarr's neatest narrative trick is to allow the film's chronology to jump backwards and forwards as required and to allow the audience to witness key events through altering perspectives. Indeed, the film is very roughly structured like a tango dance - six steps backwards, six forwards. Individually, several of the film's chapters work wonderfully. The most memorable is perhaps part five, 'Come Unstitched', in which a young girl (Tarr regular Erika Bók) tortures a cat after being ignored and mistreated by her mother and older brother. It's shocking, highly emotive viewing, and the ending to the chapter is devastating. While several of the segments work as short films on their own - the trials of an obese, alcoholic and voyeuristic doctor (Peter Berling) also stand out in that regard - everything is ultimately interlinked. The overarching story ensures that there's always a mystery about what happens next, or indeed why something we've glimpsed previously happened. Context changes the meaning of even seemingly insignificant actions here. This ensures there are more than enough dramatic questions to keep us engaged over the extended running time. The 'nothing happens' argument often rolled out for slow, meditative films is invalid for Sátántangó. It's not a walk in the park by any stretch, and you'll likely feel the burn at some point during the fifth or sixth hour, but I was impressed at how interested I was in the core narrative from beginning to end. No mean feat to be able to successfully hold a viewer's attention for so long. Eventually, the film takes on a more explicitly allegorical approach, examining and harshly criticising Hungarian society (its no coincidence the opening shot is of roaming cows). It's most obvious when Irimiás proposes his plan that strongly reflects models of communist collectivism, and in a way the film almost resembles an obtuse arthouse film adaptation of Animal Farm. Overall, Sátántangó is an altogether bleak and cynical film, with few characters represented in the most flattering of lights. Many are exploited by others, but they're also selfish, inactive and indifferent. Of the villagers, it is perhaps the young girl and a semi-strong-willed fellow named Futaki (Miklós Székely B.) who receive the most sympathetic, complex portrayals. Authority figures make rare appearances, and like everyone else they're not portrayed in the most positive of lights. In one of the film's more enigmatic sequences, a pair of officials are seemingly altering Irimiás' ideological manifesto for their own needs. Given that conman Irimiás is a brown-haired, bearded 'prophet' that the villagers mistakenly believe has risen from the dead, I don't think it's too much of a stretch to suggest Tarr is also somehow critiquing the role of religious institutions in his homeland. But I'm not going to pretend to be familiar enough with Hungarian social demographics to comment on that one any further. I'm not sure if 'East European Miserablism' is considered an official genre by the Transnational Organisation for Generic Association (TOGA for short), but if so Sátántangó is the archetype to which all genre-mates must surely hope to subscribe. It's a masterpiece, but not just because it has to be since its a seven-hour long, miserable, black & white foreign film. No, it's a masterpiece because it is stylistically singular, endlessly engaging, blackly amusing and all round beautifully realised film. That it manages all this while being a seven-hour long, miserable, black & white foreign film is a happy coincidence, and what ultimately makes Sátántangó such a pleasure to endure.